"You have been allocated Uganda"
All right, so why are we all doing it? There seems to be a natural gestation period of about forty years for colonial autobiographies (possibly a new form of biorhythm?). After that, all of us, and I do not except myself, seem able to convince ourselves that the world needs our memoirs. Some of us (and again I include myself, but I have no idea whether it also applies to the authors of these two books) undoubtedly start out with inflated expectations. Perhaps we model our first manuscripts on "A Pattern of Islands'', Sir Arthur Grimble's publishing sensation of the fifties. Hoping for similar lucrative success we send the texts with a curt note to a well known literary agent or commercial publisher. While waiting for their reply we ponder the film rights and who should pay the juvenile lead. Perhaps Hugh Grant or Brad Pitt? The manuscripts are returned intact, but with a covering letter that at least starts encouragingly. "I very much enjoyed reading your book. It is readable, good humoured, amusing and interesting". Inevitably, however, it ends with a rejection and a suggestion of self publication. To start with we ignore this advice. We recall that many classics have only been launched after multiple rejections. We bombard other publishers, quoting the flattering bits out of earlier opinions. We tell ourselves that self or vanity publication would be a defeat and that if no one at all thinks our work worthy of commercial publication, then maybe that, in itself, would be an indication that someone up there was trying to tell us something. But whatever the route, the result is the same. We are left with a heap of tattered pages, and the comment. Intended to be encouraging, that "It is miles easier to sell a rotten book by someone very well known than an excellent one by someone whose name rings a more muffled bell" . Or the more succinct reply from an American publisher, "Airport bookstalls only stock bonkbusters". So why do we persevere? Why despite all the odds, the flood of reminiscences by our contemporaries? Why these two books - self-financed in the case of Alan Forward's elegant production and part-supported by a specialist publisher for Randal Sadleir's more weighty tome, but both at prices that will ensure that no one is going to pick them up at Heathrow for a good read on the flight? Part of the reason must be that, if we don't do it now, we shall all soon be dead and the myth will have overtaken the reality. Most of us were brought up in the humanist tradition that truth will eventually prevail. But recent events, like the London University conference on "Administering Empire", have shown that, at least 40 as far as Colonialism is concerned, the opposite may well be the case. The belief in colonialist oppression is alive and well and living in Bloomsbury. Another, not unworthy, reason for publication is that we want to tell our grandchildren how we lived. Family reminiscences have a long and respectable tradition. Occasionally this can be a bit confusing, particularly if the title leads one to expect something else. 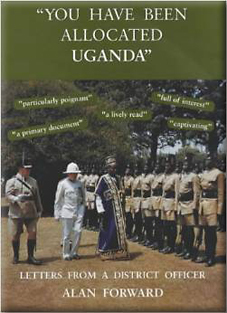 For example Anna Osmaston's book "Uganda before Amin", turns out to be an engaging but unpretentious domestic chronicle, to the bemusement of those who buy it expecting political history, (please don't take offence Mouse, your book has an honoured place on all our shelves). A third category, into which I suspect Alan Forward's book falls, is the labour of love. Immaculately produced and with the best photographs I have seen in any colonial memoir, it is a good nostalgic read for anyone who knows and loves Uganda and the Colonial Administrative Service. If anything it suffers from the fact that Alan is unwilling to be really unkind about anybody. He even manages to find some sort of excuse for the early excesses of Idi Amin. Only the incoming diplomats of the British High Commission really earn his contempt and then largely because they ignored and appeared to try to humiliate Sir Walter Coutts, the last Governor and the first Governor-General of Uganda. Alan was "Wally" Coutts' private secretary at the end of his governorship and the most interesting part of the book is his almost hero-worship of his ex-boss. In building up Sir Walter's reputation, however, he even prays in aid the first Prime Minister, Milton Obote, who proposed that Coutts be retained as Governor-General. Conscious though we all were of Sir Walter's sterling qualities, I have little doubt that the reason Obote wanted him to stay on temporarily was that he was not yet ready to pounce on Buganda, first by making the Kabaka President to keep him quiet and then by destroying him. I know that, and so must Sir Walter have done, because I listened to Obote's telephone conversations on his behalf. The most confusing aspect of Alan Forward's book, which a commercial publisher would surely have talked him out of, is the concept of writing it post hoc as if it was a series of contemporary letters to a possibly fictitious, friend. He justifies this endearingly by the fact that the Editor of The Times has published a number of his letters and he thinks he must be rather good at them. The main effect, however, is to introduce a baffling uncertainty of tenses, where one is never quite sure whether the past is really past or the present really present. Alan is a friend and he will not thank me for a structural criticism which could not be remedied without a rewrite. It does enable me to say, however, that I hope he will keep at it and maybe produce a more straightforward historical account of the last days of the Uganda Protectorate as seen from the private office of one of the major players.